For photographers working in fast-paced environments or after the convenience of a multi-purpose optic, zoom lenses are often a versatile option. Image quality on zooms has improved across many lenses, too, which in some cases come close to rivalling the performance of a prime. 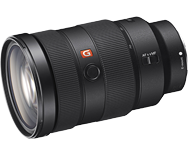 Announced as one of a trio of lenses in the new G Master series, the new FE 24-70mm F2.8 GM boasts some pretty advanced technology to complement future sensor and camera designs. The G Master range sits above the maker’s already high-end G series and carries a hefty premium. The FE 24-70mm F2.8 will set you back close to $2,200.